Although pepper spays are not an alternative when a threat requires the use of deadly force to be stopped, they do have their place as a defensive tool. When carried or staged properly, OC spray is a force multiplier designed to give you a few extra seconds to escape an attack. Pepper sprays can legally be carried in many environments where lethal tools cannot. Through research, Bearco Training has decided on Sabre Defensive Sprays as the only brand to offer our students. As a stocking dealer, we have decided on a select few models that offer the most amount of protection and ease of use. Practicing with your spray is imperative to your plan if use under stress is expected. We also have inert sprays designed as a cheaper alternative to use during training or practice. There are many sprays available on the market, but they are certainly not all created equally. Please do your own research before deciding on a particular spray. 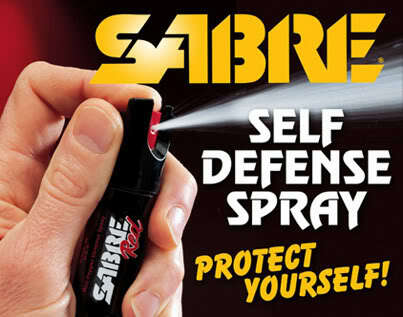 Sabre Defense is the world’s leading manufacturer of pepper spray. “Making Grown Men Cry Since 1975”, Security Equipment Corporation (SEC) is the family owned and operated manufacturer of the SABRE and SABRE RED pepper sprays. SEC also produces the FRONTIERSMAN & SABRE WILD Bear Attack Deterrent Sprays and the Protector Dog Attack Deterrent Spray. SABRE Stun Guns are also offered by SEC for those which are interested in carrying an electronic immobilization device.